Johnson Coliseum for the May 14, 2005 morning commencement exercises. 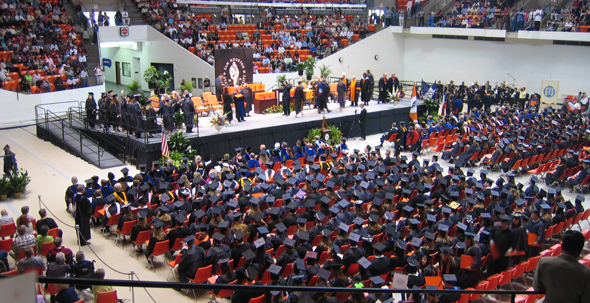 The text of U. S. Senator John Cornyn's remarks at Sam Houston State University commencement exercises on May 14, 2005. Thank you, Dr. Payne, for that gracious introduction. I'm honored to be here with you all today. I'd like to acknowledge the faculty here today, as well as the staff, alumni, parents, and friends who have all come to celebrate this occasion. Jimmy Hayley, left, SHSU regent, visits with U. S. Senator John Cornyn prior to morning commencement exercises. Graduates--I extend to you my congratulations, and my personal appreciation to your parents and families whose support has undoubtedly helped you in the pursuit of greater talents and more fulfilling careers. Here you are--after years of hard work, classes, and study--(OK, we all know it wasn't just work, classes and study)--but here you are. Today is your day. Do your best to remember this moment--to savor it. You certainly deserve this celebration of your success. Education is a mighty gift. Its power should not be underestimated. With the solid foundation you've built here at Sam Houston State, you each are well on your way to accomplishing amazing things. And for those of you in need of some career advice, I could offer you the words of President Ronald Reagan: "Politics is a good profession. If you succeed there are many rewards, and if you disgrace yourself you can always write a bestseller." I know that at this point, I'm the only person standing between you and your diplomas. But I'd like to share with you a brief glimpse of history--a story about the man for whom your school was named--as a way of encouraging you as you leave here and enter the "real world" as truly independent men and women. Sam Houston was many things: A governor, a United States Senator, twice president of the Republic of Texas. Most certainly he was a hero--larger than life. But perhaps chief among them, he was a visionary. He saw the world of his day--and knew it could be better. He watched a fight being waged during the early years of our country, and took a principled stand to seek unity through equality. Eight years before Abraham Lincoln used the phrase "a house divided against itself cannot stand," Sam Houston said: "A Nation divided against itself cannot stand." Those were the words of a visionary--the words of a man who looked at the world around him, who was able to make observations and incorporate them into meaningful and powerful action. In their book "From Slave to Statesman," authors Jane Monday of Huntsville and Pat Prather of Houston discuss the relationship between Houston and Joshua, one of his slaves. They reveal that the relationship between the two men "defies the stereotypical images of black/white relationships of the time," and state that Joshua was taught to read, write, allowed to keep the money he earned, and allowed to keep his family close to him. Texas legend has it that Houston freed his slaves before it was legally required. One recalls Houston reading the Emancipation Proclamation from the steps of his house, telling them all they were free to go. Joshua left and took the last name of Houston, and, according to Monday, "was a tireless worker for the cause of peace between the two races." Houston's thinking was ahead of the time. His acts in office as president of the Republic of Texas, then later as governor, indicate he disagreed with the idea of slavery. He refused to permit bounty hunters to be paid for capturing escaped slaves, and prohibited slave trafficking. While in Congress, Houston voted against the Kansas-Nebraska Act, which would have allowed slavery to spread westward, and it is said he ruined his chances to be elected president of the United States by casting this dissenting vote. On Principle, he stood against the proslavery congressmen who did not want to see a free territory west of Missouri. He voted against it despite the fact it was something Southerners favored--and it cost him what some would have thought to be a more glamorous political career. Of course I realize this is an emotionally charged, controversial subject that reveals a darker day in our history. But I tell this story about Old Sam today as a way of encouraging you to think about your future, to contemplate your calling, and cultivate your vision. Because each one of you has that visionary potential. Perhaps as you sit here today, you feel some restlessness about your future. You may not know what path to chart. But have confidence that you will find your way, if you are curious and conscious and engaged enough to seek it. You are all on the verge of freedom--freedom from the rigors of study, free from the listings in a course catalog mapping out the months that stretch out before you. But you're also about to enter a world where you are free in a broader sense--free to decide the course you will take in life. The question now is what kind of person you will become. What will you do with this precious life you have been given? The people who change this world for the better are those who are dedicated, who work hard, and who live as if they cannot fail. Rather than being self-focused, they look outward, to a purpose greater than themselves. Old Sam exemplifies this idea. He was willing to sacrifice personal glory for principle--and many people benefited from that decision. So I encourage you today to be men and women of courage and conviction. Be men and women who use the freedom you have to seek a common good. Be men and women of purpose, who leave this world a better place than you found it. To the fine graduates of Sam Houston State University, I say: Congratulations on your achievement. May God bless you all, and may He continue to bless our great country. 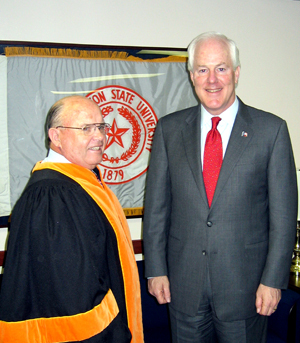 For biographical information on Senator Cornyn, see Senator Cornyn is Commencement Speaker.